WMPG is proud to announce the 2017 Cajun Cookin’ Champs, Sodexo USM Dining Services, with Chef Matthew Sanderson’s Chicken Gumbo Bites, which were surely the talk of the day! How to describe these delicacies: kind of like hush puppies made from gumbo. Original, and amazing! 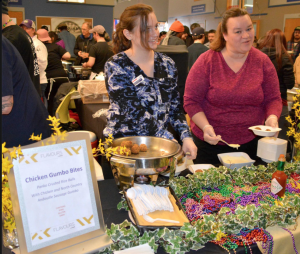 WMPG is also pleased to recognize Bayside American Café, in second place with Head Chef Alana Woodbury’s Shrimp and Andouille Etouffée with creamy lobster sauce, veggies and Cajun spices. All of the restaurant entries were deliciously noteworthy this year, with entries from Gritty’s (2016 champs! ), Abilene Portland, Silly’s Restaurant, Po’ Boys & Pickles, Great Lost Bear, Izzy’s Cheesecake and Whole Foods. The event is WMPG’s celebration of the Acadian-Cajun Connection and Maine’s special relationship with the people, music and flavors of New Orleans. Each year, this mid-winter party is a huge thank you to the people Southern Maine, and at USM, for keeping WMPG Community Radio alive and well for over 43 years.